I hesitate to say I have tamed the skew, but at least I can live in the same house with it now. I went to the “Taming of the Skew” class at Highland last week and we spent three good hours with Hal Simmons, a professional turner, to try to solve some of the problems many people have trying to use a skew chisel. We started out by learning how to sharpen the thing, first on a grinding wheel and then to a flat stone. 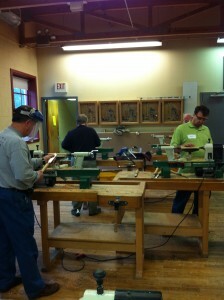 As with almost any woodworking operation, having a sharp tool is a good thing. Hal asked each of us in turn what experience we had and what our issues were with the skew. After some discussion we moved to the fun part and we all got a good laugh. 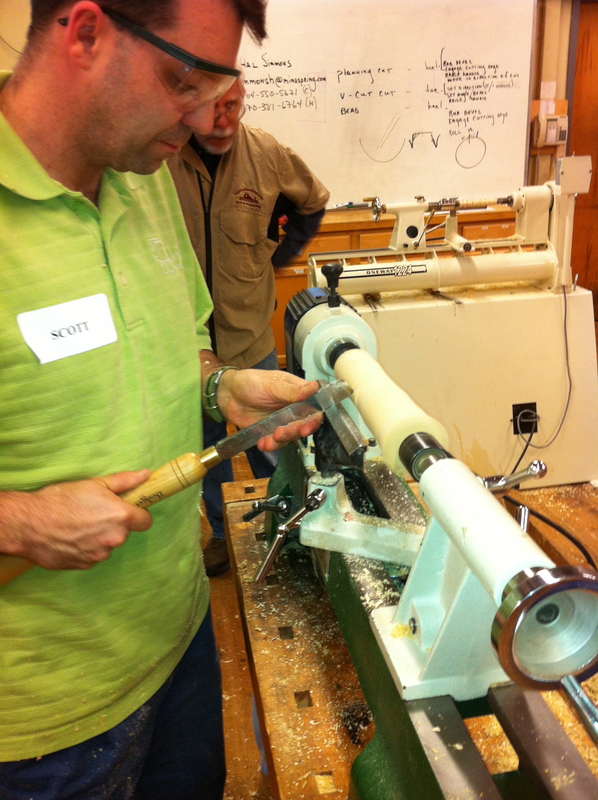 When Hal had a square piece of wood set up in the demonstration lathe, he turned the lathe up to very high speed and prepared to stick the skew into the wood. The whole class scattered like a flock of buzzards when a car comes along and Hal was standing there by himself. Apparently we all shared the same fear of the skew. 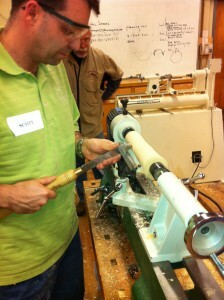 Once he calmed us all down and got us back to the demo lathe, he demonstrated how to use the skew to round off a work piece. He was standing there rounding that wood and not even looking at it, and we were all standing around with our mouths open and pleading with him to watch the work, because we were absolutely positive we knew what was going to happen and it was not going to be pretty. After we learned the basic planing cut, we moved into cutting a groove and then to widening that groove into all those beautiful shapes found on candle holders and chair legs and balusters. 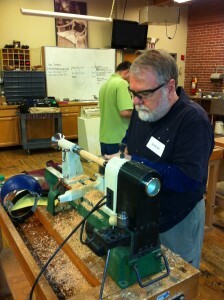 The cuts are simple in theory when explained well, but as with most skills, take a while to develop the proper motions. It’s the same answer you get in New York City when you ask someone how to get to Carnegie Hall. Practice, Practice, Practice! At least I am not afraid of the tool anymore, and with a lot of practice I should be able to make some nice stuff. What a great class and it is offered every few months at the High. It runs from 5:30 to 8:30 in the evening and only costs $75. Go ahead, tame that skew!! The Plane Facts: The Boggs Curved Spokeshave The Plane Facts: What’s So Special About This Ductile Cast Iron?